Okay, full disclosure: I've never had the real Dole Whip. But I caught wind of this icy treat online and it sounded absolutely scrumptious. So I decided to try making it at home using all natural ingredients (unlike the actual Dole Whip, which is not really made from fruit at all). Though a Dole Whip has the taste and consistency of soft-serve ice cream, the dessert actually gets its texture from ordinary food thickeners. Only a small amount of the milk derivative sodium caseinate accounts for dairy content. So I did a little bit of poking around online, looking at how people were making their homemade Dole Whips, and I came up with my own little recipe using their experiences. A lot of people use the powdered mix of Dole Whip you can order online, some mix pineapple juice with whipped cream, and yet others use those machines that turn fruit into frozen desserts. My Dole Whip recipe is slightly more work intensive but good if you don't like whipped cream, don't own one of those machines (but own an ice cream maker), or just have a lot of pineapple lying around! First of all, my recipe is closer to an ice cream than a sorbet. 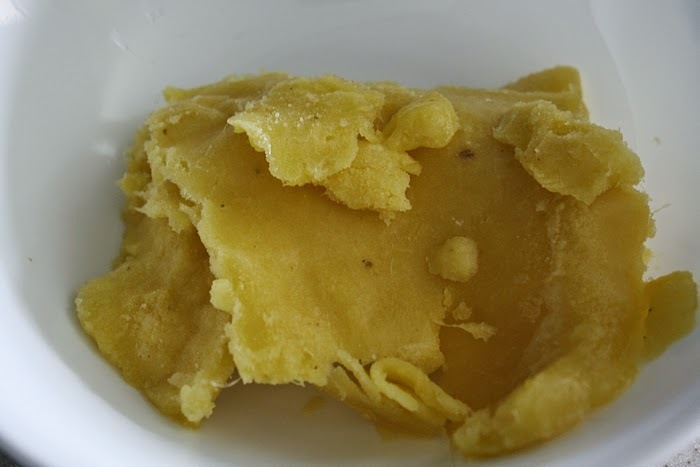 This recipe uses real pineapple (you can use canned), so there were pineapple fibers throughout the finished product. 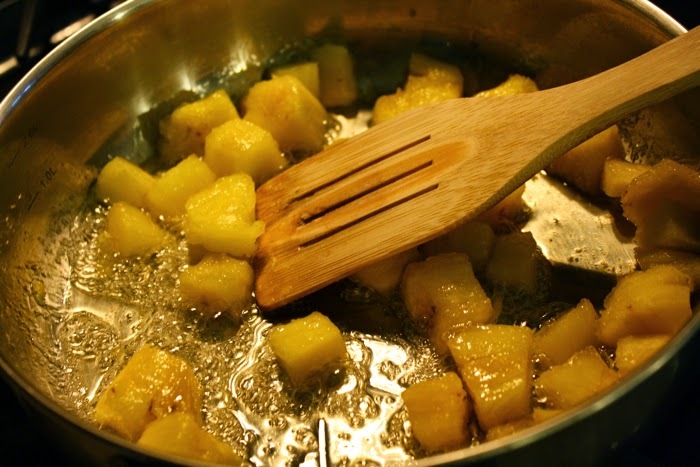 I also read that cooking or roasting fruit brings its flavor out even more (it can also intensify the color), so I started this recipe by cooking the pineapple. This is a step you can also skip. 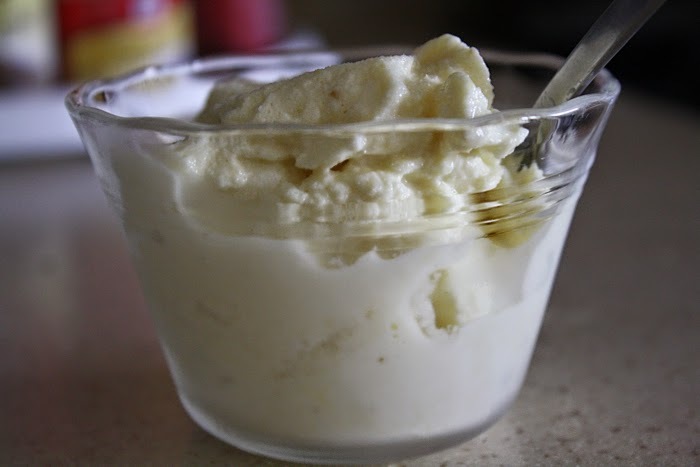 If you don't own an ice cream maker, you can definitely still use a version of this recipe -- instead of pureeing the pineapple and making the ice cream base, freeze it after cooking and toss the frozen chunks into your blender with the cream and milk and blend until it becomes creamy. 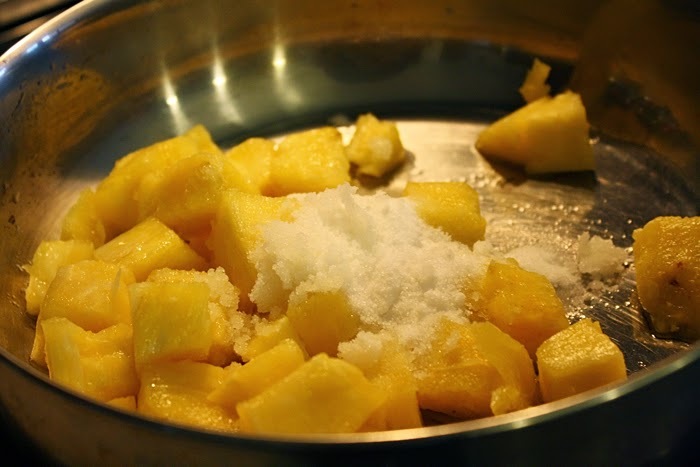 Cook the pineapple, sugar and lemon juice in a saucepan over medium-high heat for 30-40 minutes, or when the pineapple begins to become translucent and the sugar reduces and becomes slightly brown and syrupy. Allow to cool and transfer to a blender and puree. 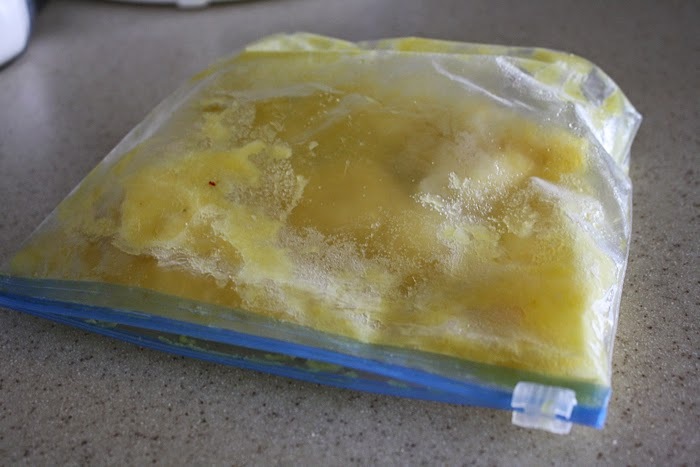 Pour into a plastic bag and freeze for several hours or overnight. The next step is creating the ice cream base for the pineapple. In a large bowl, beat the eggs and slowly add the pineapple puree and cream (or half-and-half). 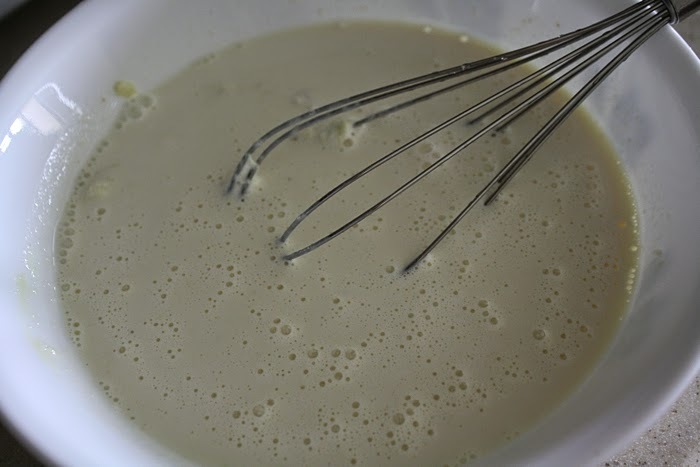 Whisk in the milk, if using. Add a pinch of salt, lightly mix, and chill for at least 2 hours. 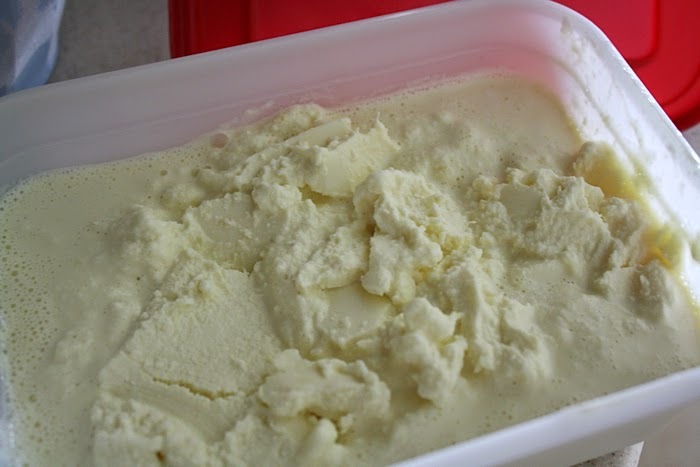 Add the chilled mixture to your ice cream maker and follow your machine's instructions. For best results, place the result back in the freezer for 2 to 3 hours before serving. This makes a sweet, creamy not overwhelmingly pineapple-y ice cream. 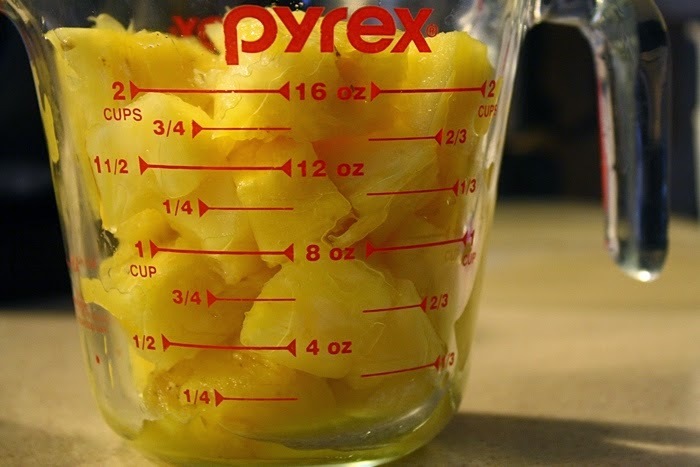 If you'd like a stronger pineapple flavor, I'd imagine you could either add more pineapple chunks or incorporate pineapple juice into the recipe (though it wouldn't be as creamy). Delightfully refreshing, and a slightly different offering than the typical piña colada ice creams available.